Our foundry management have identified some key areas that would inform the end user of our gray cast iron applications to complete their finished product. 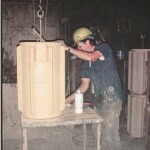 A variety of metal castings produced by our job shop foundry has been detailed by specifications such as pattern procurement and maintenance, pepset – greensand, cope & drag molds, economical cores by shell, airset, or oil, various sized flasks with hot cast iron poured from two water cooled cupolas – six tons per hour. Upon cooling, the iron is run through shake out and unfinished castings are in process of degating, spin-off or blasting and grinding; optional customer needs could be primer painting, brinnell, ultrasonic and hydrostatic for pressure vessels. Motor housing – 1000 lbs. Boiler section – 45 lbs. 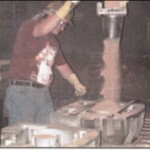 With over 100 years of gray iron casting excellence from our job shop foundry, we produce the casting our customers ask for with quality results. We are members of the Ohio Cast Metals association (OCMA), confer with American Foundry Society (AFS) and network with other organizations that educate and promote our industry’s foundrymen and markets for metal casting.